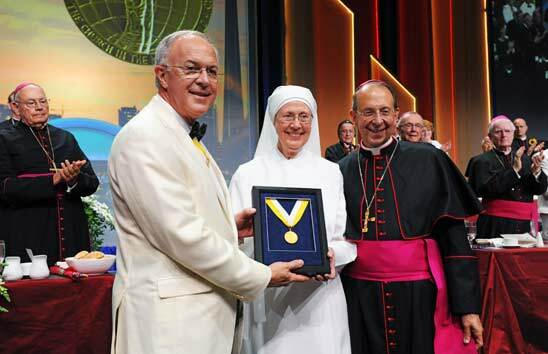 At the 134th Supreme Convention, the Knights of Columbus awarded its highest honor to the Little Sisters of the Poor for their example of Christian service to the poor and dying, and for their continued commitment to their Catholic beliefs even in the face of strong government pressure. The Gaudium et Spes Award was presented Tuesday evening, Aug. 2, at the convention’s States Dinner. Knights of Columbus Supreme Knight Carl Anderson presented the award to Sister Loraine Marie Maguire, the order’s mother provincial in Baltimore.